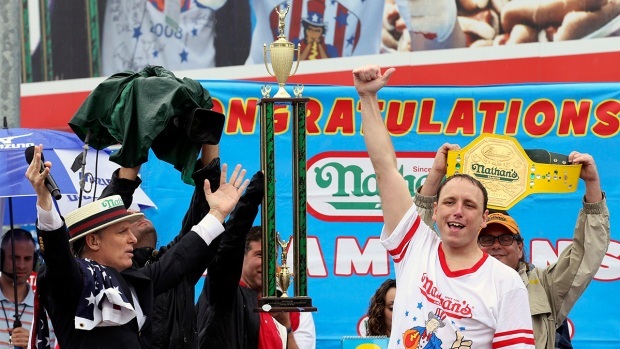 Champion hot dog eater Joey Chestnut has done it again — and he's getting hitched, too. The powerhouse eater nicknamed "Jaws" downed 61 dogs in 10 minutes for his eighth straight win at the annual Nathan's Famous Fourth of July Hot Dog Eating Contest at Coney Island. He came from behind for the win against competitor Matt Stonie, who consumed 56. Chestnut earlier took a timeout from the competition to propose to a fellow competitive eater, getting down on bended knee to make it official with longtime girlfriend Neslie Ricasa. She said yes. The happy couple hails from San Jose, California. On the women's side of the competition, three-time defending champion Sonya Thomas lost her mustard belt to Miki Sudo of Las Vegas, who wolfed down 34 franks and buns. The 47-year-old Thomas, a native of South Korea who now lives in Alexandria, Virginia, was only able to devour 27 3/4 hot dogs and buns. 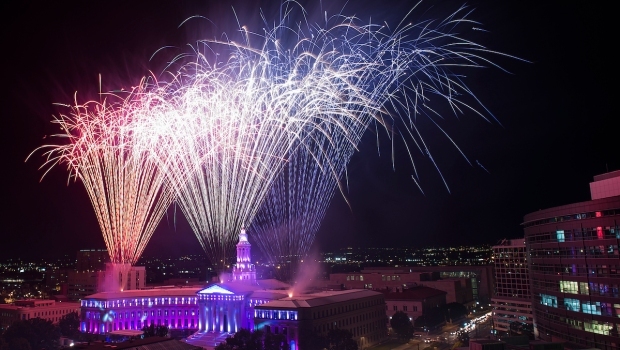 Seventeen men and 13 women competed in front of a crowd of about 30,000 spectators and a TV audience of about one million in the contest, now in its 99th year. Chestnut, who tipped the scale at 205 pounds, had hoped to put away his competition by downing a record 70 hot dogs in the raucous event held just steps from beach. Last year, Chestnut won with 69 franks and buns. Matt Stonie, who also came in second in 2013 (with 51 dogs), weighed in at 130 pounds this year. The top four competitors weighed in Thursday at a pre-contest event presided over by Mayor Bill de Blasio. 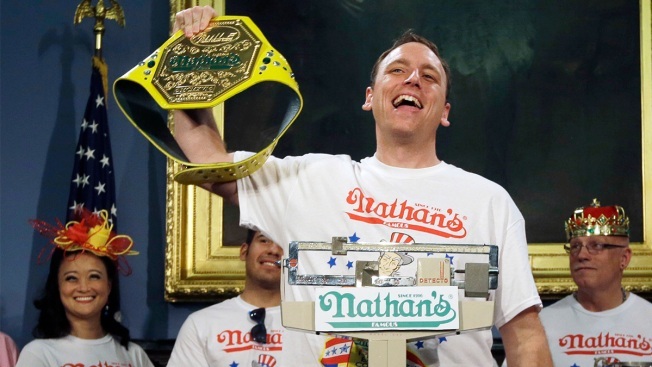 Each of the competitors said Thursday they were fasting, but Irish contestant Colin Shirlow grabbed a free hot dog during the weigh-in to get a first taste of the Nathan's Famous dogs they'll be gobbling down.